Star Trek’s Seven Life Lessons: How do the Pagan Princesses Measure Up? Earlier this week, David Borgenicht wrote an article in the Huffington Post called “7 Life Lessons You Can Learn from ‘Star Trek’.” Is it just me, or can his surname be translated into “Night of the Borg” in English? * [Hmm….admittedly, this colors my reading of his article.] Like David Borgenicht, I too am a Trekkie. I don’t have any collectibles and I haven’t gone to any conventions, but I have deep respect and affection for Gene Roddenberry (the creator of Star Trek) and his accomplishments on the small screen. So, when one of my friends shared this article with the Grand Overseer (Facebook), I was intrigued. And I wondered how the Pagan Princesses measured up according to these life lessons. 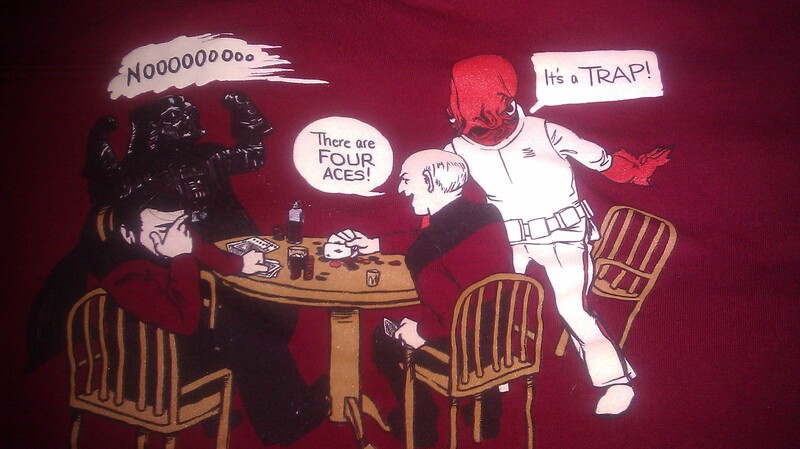 Star Trek / Star Wars mashup t-shirt. A peace offering from Jax and TheScott and now one of my favorite shirts! Four out of seven check marks. That’s not bad, is it? What about you readers? Do you like Star Trek? Do these seven lessons resonate with you? How do you measure up? * Nicht is “night” in Scots. It’s also “not” in German, but Not of the Borg isn’t as funny. ** In the context of TPP, this resonates with me. But in a larger, social context, this doesn’t always ring true. As a constitutionalist, I believe preserving the rights of the few is equally important to preserving the rights of the many. I could go all sociologist on you right now, but I won’t. Just know this argument is a slippery slope, especially when you describe “many” as “majority” and “few” as “minority”. Majority and minority refer to the distribution of power in a social context, not a count of people. Okay. Whew. Stopping now. *** And my attraction to emotionally unavailable men is explained. I’m just kidding. I grew out of that. I think. I hope! + Featured image, the Enterprise from Star Trek: The Original Series. Star Trek is love. I love Spock too but Bones has to be my favorite. 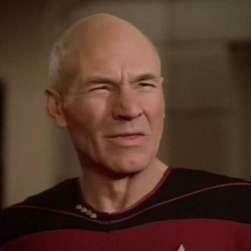 Oh and red isn’t a target if you’re an engineer… or Uhura. As a redhead, I can testify to the red = target correlation. When I lived in NYC in 1980, I endured a of of sexual street harassment that ranged from the call-out “hey Red, how about…?” to being grabbed in the subway. When I told a friend about it, he offered the serious furrowed-brow face (as seen above), and asked “well, why don’t you just dye your hair brown?”. Though not a pagan, I enjoy your blog. Thanks for writing. Hi Laurel! I’m so glad to know you are enjoying the blog. I agree, being a redhead does make us targets. I can’t believe some of the things people say to me about my hair – people who don’t know me or haven’t even met me before. Some comments (usually questions) are downright scandalous, but usually make me shake my head and smirk. Others seem innocuous, but I find them even more offensive than the scandalous comments. “Is that your real hair?,” “Is that your real color?,” “Did your parents have red hair?” Geez. Nobody asks blondes or brunettes these questions. Is red hair such an anomaly that it requires verification? Oy.